Jeffrey Welch's Blog: Pre-Adoption Checklist: Are You Really Ready to Adopt a Dog? Pre-Adoption Checklist: Are You Really Ready to Adopt a Dog? There are few things in life as rewarding as adopting a dog, but it’s a commitment of 10 to 15 years and many factors come into play. Scores of dogs end up in shelters every year because pet parents didn’t fully consider factors such as money, time commitments and other family members. We’ve asked some experts to help devise a pre-adoption checklist to find out — are you really ready to adopt a dog? 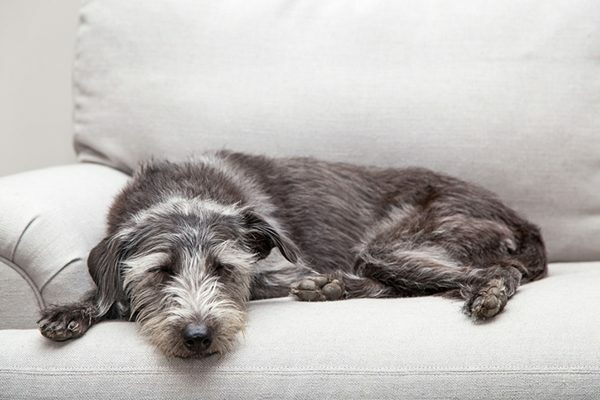 A dog relaxing on a gray couch. Photography by adogslifephoto/Thinkstock. 1. Do you know what it costs to adopt a dog? Beyond the adoption fees, which can run anywhere from $5 to $500, there’s the yearly cost of caring for a dog — which is an estimated $650. This includes food, heart worm prevention and flea and tick medications. That figure doesn’t account for dog walkers, pet-sitting services or emergency vet visits. 2. Do you actually have enough time to commit to a dog? Are you looking at the bigger picture and ready to take the time to adjust your latest charge to his new digs? Whether you’re adopting a rambunctious puppy or a sweet senior, every dog needs training — from a young pup who requires complete housetraining to an older canine who just doesn’t know your routine yet. And, depending on the dog, walks will range from 10 minutes to multiple hours per day. 3. Is there any chance you’ll have to move or change jobs? The Greek philosopher, Heraclitus, said, “change is the only constant in life.” From antiquity to modern times, this statement holds true. Your work and home life might be stable now, but a dog is a 10-to-15-year commitment. Your entire life can be greatly altered with one career change. Are you ready to take your dog with you if you have to move? And what happens if your career gets demanding and you have to hire a dog walker — are you willing and able to pay extra for pet care? 4. Is there any potential for people or other pets to develop an issue with the new dog? Take a good long look at your circumstances. Who else will be sharing the space with your dog? Has that person — or pet — lived peacefully and healthfully with other dogs before? Michele Forrester, senior director of operations of Animal Rescue Fund of the Hamptons, says, “Sometimes [dogs are returned] after they are in the home for a while and a family member finds that they have developed allergies to the pet and they don’t take the proper steps to manage the situation. Or [they’re returned] when a food guarding or a toy issue that wasn’t evident during our mandatory meet and greet with their existing pet occurs.” If you are certain you have the ways and means to handle any unexpected issues, then you’re ready to adopt a dog. 5. Are you ready to be selfless? It’s easy to walk your dog on a sunny Saturday afternoon. But what about at 3 a.m. on a snowy Wednesday night? Dogs are demanding of your time and resources, even when you don’t feel like it. They’re a big responsibility and sometimes an inconvenient one, especially when all your friends are road-tripping for the weekend and your pet sitter is out of town. For potential first-time dog guardians, if you can pass up some of your previous lifestyle choices because you’ve got a new full-time dependent, then you’re ready to adopt a dog. For those not 100 percent sure, fostering a dog is a good way to learn if you’re ready. There’s so much more to dog guardianship than unconditional patience and love. If you’ve answered “yes” to the questions in the checklist above, you are ready to adopt a dog. Now all that’s left is finding the right dog for you! The post Pre-Adoption Checklist: Are You Really Ready to Adopt a Dog? appeared first on Dogster.